Kelvinic University is a fully accredited, independent institute of higher learning that offers Bachelor's, Master's, and PhD programs in a wide range of subjects, as well as continuing education and self-fulfillment workshops. Our Thermodynamics-BasedSM approach offers a profound innovation in education. Also, see our educational options for kids and high-school level teens. Employing the Laws of Thermodynamics developed by William Thomson in the 19th century, the Thermodynamics-Based approach works with Nature to cause a local decrease in Mental Entropy, more commonly referred to as learning. This scientifically proven technique, used widely in industry, physics, and engineering, and applied for the first time at KU towards education, helps our students flourish and prosper academically and personally. By instilling in our students an awareness for the Thermodynamic Laws that govern nature, and how they can be applied to science, business, the humanities, and their private life, our approach virtually guarantees success in all endeavors that our graduates choose to tackle. Our mission is not only to provide these benefits that come from a Thermodynamics-Based approach to our students, but to also disseminate Thermodynamic thinking through-out business, the arts, and public policy making -- world-wide -- for the betterment of society and the individual. Kelvinic University was founded in 1989 by a group of concerned educators, entrepreneurs, and community leaders as an institution that would help bring the Thermodynamic-Based approach into education. Since then, it has grown to become a thriving and vibrant center of learning and research that serves people, young and old, from all over the globe. You too can become a KU Graduate! At Kelvinic University, we have a wide range of departments, programs, institutes and centers offering advanced degrees and research opportunities in important, challenging, and rewarding fields. We also have Preschool and K-12 programs. The Kelvinic University campus, sprawling leisurely across 210 acres of recovered apple orchards, is located just outside of the small farming town of Ullapool in Eastern Washington state, USA. Conceived as a self-contained community, the KU campus features all the facilities (housing, medical, recreational,) that are needed by our 2000+ population of students and faculty members. Our student body is diverse, made up of students who come here from all over the globe. The same is true of our instructors, who have been recruited from academia and industry worldwide. We truly are an international institution. This diversity is something we are proud of, since it offers our students a rich view of ideas that will help them, not only personally to make their way in the interconnected world of the future, but also to create a society that will embrace the non-Entropic principles of tolerance. All this means that our campus has, not only the feeling, but the true essence of a Global Community. The KU campus has many state-of-the-art lecture halls, labs, and workspaces. All are fully equiped with networked computers, audio/visual equipment, and ThergonomicSM learning stations. 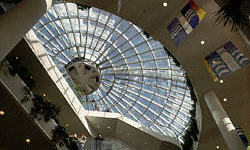 William Thomson Hall, home of the main Library. The Kelvinic University Library system is a model of what the 21st century library will be like. Besides an extensive collection of books, periodicals, and journals that rivals the most impressive university collections of the world, we have a cutting-edge Digital Library System, which allows access (via the next-generation Internet technology,) to the contents of the library from anywhere on campus -- or even the other side of the Earth! The KU Library is also on the cutting-edge in the field of data management. Since most large collections of information tend to increase in Entropy over time, a full understanding and application of the Laws of Thermodynamics is a must. Our Information Theory Department, which runs the KU library system, is in the international forefront of applying the Thermodynamic-Based approach to library management. Our system has been studied by universities, governments, and businesses the world over and is widely hailed as a ground-breaking advancement. We also have numerous collections of historical and archaeological works and artifacts for academic study, such as the William Thomson Autograph Collection, which includes original correspondence and drafts of his many scientific papers. Housing for all our students and faculty is provided on campus. Student dorms are spacious and all come with a computer wired into the KU network. All our housing was designed by our Thermodynamic Architecture department to provide our students with an ordered, non-Entropic, environment in which to rest, study, and socialize. Great views of the many KU gardens and lakes plus the feeling of camaraderie that comes with living in a dorm environment, all add immensely to the experience of attending Kelvinic University. Kelvinic Levitation students dining at the Crystal Dome Cafeteria. Our campus cafeterias serve a wide variety of healthy, nutritious, and tasty foods, engineered by our Kelvinian Medicine department's Nutritionology branch to serve all of your counter-Entropic dietary needs. Our Agritechnology department's gardens provide us with abundant fresh fruits and vegetables -- many of exotic origin -- grown Thermodynamically. Since KU's students and faculty come from over 25 different nations, we offer many different regional and ethnic types of food to help them feel at home. So whether it's curry or haggis, you can find it on the KU campus menu. All your medical needs can be met without having to leave the KU campus. We have all the facilities to provide everything from first-aid to surgery. All our medical staff have been trained in our Kelvinian Medicine program and exceed the highest standards. Plus, they are fully versed in the application of the Thermodynamic-Based approach to medicine. By using Thermodynamics to treat the whole body, not just the symptoms, our health care system far surpasses that available to most of the industrialized world. Daycare for children of students and faculty is provided by our ThermoFirstSM pre-school center. The Second Crystal Dome, home of the Kelvinic Levitation Club. Your leisure time can be richly spent on the KU campus. 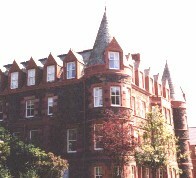 Amongst the many activities and recreation facilities we have to offer, you can: stroll through our gardens and landscaped walking paths; play a game of tennis or jai alai on our many sports courts; visit our museums of student works, including the largest golfing museum outside of Scotland; take in a student produced play, concert, or movie in one of our five luxury theaters; see demonstrations of Kelvinian Levitation in the Crystal Domes by students in our advanced Kelvinian Meditation program... the possibilities are endless! Most importantly, on our campus you can surround yourself in the learning, community spirit, friendship, and non-Entropic growth that comes from applying -- or rather living -- the Laws of Thermodynamics. This Thermodynamically immersive, or ThermmersiveSM, environment is an experience that our graduates take with them in their hearts and minds when they go on into their post-university life. Many even return to our campus for symposiums and extension courses -- or even to teach -- just to experience it all again, fresh as if it were the first time. Coming to KU to live and learn, you will be embarking on a grand adventure into self-discovery and Entropic decrease, not just in class but also in your campus life. Besides offering university and continuing education level programs, we also offer our pioneering Thermodynamics-Based approach to unlock the inner potential of every child, even yours! 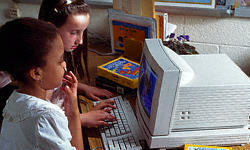 Children learning Thermodynamics on a computer. The Thomson School is our K-12 education facility. Here, your child will not only learn all the basics of knowledge and conduct that one would expect from a quality private school, but they will also be challenged to excel using Thermodynamics-Based learning and motivational technology. Located on the KU campus grounds, the Thomson School has the same diverse student body and ThermmersiveSM environment that helps give KU its unique feel. Give your child the gift of Thermodynamics. Our ThermoFirst™ pre-school program has been proven to out compete Head Start in standardized academic testing scores as well as the Hemple-Bimchei Life Enrichment Profile™. Prepare your child for his or her educational career the Thermodynamic way and watch his or her Entropy decrease! We at KU take the whole person into account when reviewing our applicants. Factors that are considered include: grades from previous education; standardized testing scores such as the SAT, GRE, ACT, H-BLEP, or GMAT; extracurricular activities, work experience, or community service where applicable; recommendation from instructors or employers; and information from the admissions materials and essay questions. Besides these more formal factors, we also look at the drive and motivation for learning that the applicant expresses, a key to determining his or her potential for success. This more personal appraisal can be made by an interview with an Admissions Officer, either on campus or over the phone. For the Fall term, it is best for U.S. applicants to apply by April 15 to have greatest access to the maximum financial assistance available from federal and state funding sources upon acceptance to the University. International applicants are advised to apply by June 15 to allow enough time for visa processing. For all students, early application insures that space is available in the program for which you are applying. Applications received after April 15 (U.S.) and June 15 (international) will also be reviewed, and in many cases programs will be able to accommodate you if you are accepted. Some programs also enroll students at mid-year in late January. If you are interested in this option, you can learn about these programs from the Admissions Office. For information on current prices for tuition, room and board, supplies, and other costs, contact the Admissions Office. Extensive financial aid is also available. Please remember to authorize pod for return delivery. Kelvinic University is an Equal Opportunity Institution.